Hailed as the “diamond of the kitchen”, the white truffle from Alba is among the most expensive in the world, commanding up to $700 per 3.5 ounces depending on the quality of the supply. While the black truffle, the more common variety, is used in cooking, the rare white one should be served raw–never cooked. At most restaurants, I had it shaved over a simple bowl of pasta in butter. 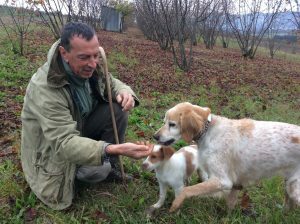 The Italians enjoy white truffle raw–never cooked. As for what to pair with white truffles, Barolo and Barbaresco are the most prestigious wines of Piedmont (and mighty delicious). For a less expensive alternative, Barbera is a fine choice and it doesn’t require aging. These wines are medium-to-full bodied with aromas of strawberries, violets and sometimes minerals or tar. 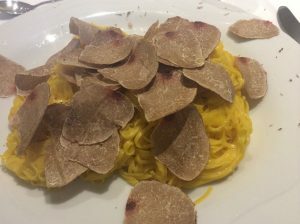 Like a lot of Italian reds, they can have prominent acidity and/or tannins, so be sure to have your bowl of tagliatelle pasta with butter and shaved truffles at the ready. For more on Italian wine and food pairings, grab a copy of my book, How to Drink Like a Billionaire, and check out the video to see what I dug up!